In his article in 2016, Harvard biologist Jack Szostak, a Nobel Prize winner, claimed that he had discovered a method that allows ribonucleic acid (RNA) to self-replicate. This claim has been introduced as an answer to a very important question about the origin of life. However, only after a year, he was forced to retract his essay. Szostak’s lab at Harvard University has been hard at work trying to find an answer to the origin of life for many years. Of course, this research is not objective or unbiased; their efforts are based on the assumption that life emerged through coincidences on its own, that is, by so-called evolutionary mechanisms. Szostak’s lab was particularly interested in how RNA could replicate itself without enzymes. In the article that Szostak had to retract, he claimed that RNA could self-replicate without enzymes. It is noteworthy to briefly explain why Szostak and many other scientists are desperately searching for the supposedly “self-replicating” RNA. Evolutionists find themselves in a conundrum when they try to explain how the DNA molecule that contains the information of the proteins came into being in the first place. Having failed to explain the complexity of DNA through coincidences, evolutionists sought new ways to explain it in the 1980s. Harvard chemist Walter Gilbert developed a scenario in 1986, claiming that billions of years ago, a self-replicating RNA molecule was somehow formed by itself. He then claimed that this RNA molecule suddenly started to produce proteins with the help of environmental conditions. After that, he claimed, a need to keep this information on a second molecule arose, but he claimed the DNA molecule, nevertheless, managed to “form on its own”. Like many evolutionists, Szostak believes that RNA was the first organic molecule to come into being. However, evolutionists need to show how RNA can replicate itself without other enzymes and proteins. This is what Szostak’s lab was working on. They thought that if such a mechanism was found, the RNA’s ability to self-replicate would be confirmed, and that RNA could have formed through so-called evolution before DNA or proteins existed, which they hoped would provide a foundation for the evolutionist claims to the origin of life. However, they never achieved this goal because neither RNA nor any part of the cell were products of coincidence. The article that was published in Nature Chemistry in 2016 as a “discovery” that supported the theory of evolution, and that prompted Nobel prize winner Szostak, was about this “finding”. However, post-doctoral researcher Tivoli Olsen from Szostak’s laboratory could not obtain the same results despite repeating the same experiments. Not only was he unable to obtain the same results, Tivoli also saw that the previous results of the experiment had been misinterpreted. In fact, Szotsak’s sincere confession is quite significant. The theory of evolution, which is not based on evidence, has been advocated for materialistic purposes because it was considered as the only way to deny the existence of a Creator. Every scientific finding, from the moment they are discovered, has always been interpreted based on the theory of evolution by these people. As seen in Szotsak’s confession, their belief in evolution mars the objectivity of many scientists, causing them to misinterpret findings. What is even more interesting is that how Szotsak’s words, which were aimed at those who believe in creation, actually described his own situation. As can be seen, Szotsak’s words, in fact, quite accurately described people who blindly believe in the theory of evolution, even though there is no evidence to support it. The theory of evolution is a non-scientific belief. Materialists and evolutionists have firmly embraced the theory of evolution to avoid acknowledging the fact that the universe and life are the products of a Creator. In fact, since the 19th century, science has been stalled by evolutionist and materialist perspective, and a great amount of time, energy and material resources are being wasted in this regard. Every piece of evidence, from fossils to microscopic discoveries, are being assessed from an evolutionist and materialistic perspective. The coexistence of the “necessary substances”, “necessary environmental conditions” and “necessary interventions” in necessary amounts and in the right time, in an idle, purposeless, aimless, uncontrolled environment, where no knowledge and intelligence exists as evolutionists claim, is indeed impossible. Even for the formation of a single RNA molecule, an intelligent, knowing and powerful Creator must exist. This is a very clear and definite truth, a truth demonstrated by science. Any effort to prove otherwise are condemned to be “retracted”. 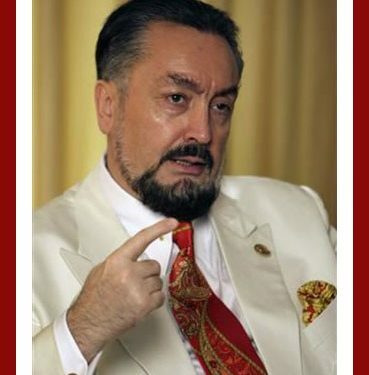 Adnan Oktar who goes by the pen name, Harun Yahya has authored more than 300 books translated in 73 languages on politics, religion and science. He tweets @harun_yahya. He broadcasts on A9 TV at en.a9.com.tr.